Coaches help the OotM teams learn basic skills and keep practices fun and productive, but they don't help the teams develop their long-term problem solutions. Every family that participates in Collingswood Recreation Program Odyssey of the Mind is expected to volunteer their to support the program in some capacity. Perhaps you have time to be a coach or a judge at a tournament or to lead a workshop. Maybe you have a great basement for storing supplies or a space for hosting post-tournament celebrations. Maybe you know how to raise money, or how to wrangle children, or have a good contact at a thrift store. We have a need that that fits your skills and availability! Coach - Remember when you coached little league? Well, this is kind of like that, except it goes from November to March (or even late May) and at least 2 nights per week (and more as you get close to tournments). Younger teams need 2 or 3 adult coaches; older teams typically need only 1. We can pair you with an experienced OotM coach if you're interested in coaching for the first time. Coaches assemble teams, coordinate practices, support and mentor players, and do all that standard coach stuff. One thing OotM coaches don't do, however, is help the teams solve their long-term problems. OotM is "hands on for kids, hands off for adults." Coaches help the teams learn the skills to compete in OotM, but the kids do the competing. Attendance at the NJ OotM coaches training is strongly encouraged.​ All coaches must be residents of Collingswood, Oaklyn, or Woodlynne, and must be 21 years or older. Primary Club Leader - Serves in a coach-like role for a group of 2nd graders who are participating in OotM for the first time. Primary Club meets once a week and does not compete at tournments. Many of our current coaches were once Primary Club leaders who "moved up" when their kids became eligible for the competitive divisions. All Primary Club leaders must be residents of Collingswood, Oaklyn, or Woodlynne, and must be 21 years or older. Assistant Coach - November to March (or even May!) commitment, 1-2 nights per week. If you aren't quite ready to coach, but would like to assist the coaches with supply gathering, child corralling, taking groups of kids shopping for supplies, and other tasks. We could use many assistants. All assistant coaches must be 18 years or older. Judge / Official - Every OotM team must contribute judges and officials to help run the tournaments. These can be parents, friends, teachers, older siblings, or anyone else 18 years or older. We must be able to rely on the judges and officials because our teams will be penalized if a judge or official doesn't show up for a tournament as promised. Judges are responsible for watching and scoring presentations (think of the judges for figure skating at the Olympics). Being a judge is a 2 or 3-day commitment. All judges must attend the judges training on February 2, 2019 and the Coastal Plains Regional Tournament on March 2, 2019. If our teams advance to the NJ State Finals, some judges will also be required to attend that tournament on April 6, 2019. Non-judging officials do all sorts of logistics, such as staffing the snack table. It is a 1 or 2-day commitment. Non-judging officials do not need to attend the training, but all officials must attend the Coastal Plains Regional Tournament on March 2, 2019. If our teams advance to the NJ State Finals, some officials will also be required to attend that tournament on April 6, 2019. Workshop Instructor - Leads a 1 – 2 hour workshop about painting/sewing/team work/singing/gear ratios/electricity/whatever. Honestly, no experience necessary. These are 9 year olds. If you can sew or act or sing or build, you can do it better than them. Could use many workshop instructors. Officials Coordinator - responsible for recruiting, care, and feeding of officials - probably should have been an official already, and can be an official again this year too. Form Boss - make sure all forms and paperwork are completed before tournaments. This job takes place right before a tournament, and involves gathering needed forms and harassing children and coaches to fill them out. Space Coordinator - Arranges with schools/churches/community centers/etc. for practice space; meets with administrative people at buildings. Excellent position for someone who knows or is familiar with potential available spaces around Collingswood, and is good at making friends with the people in charge of those spaces. Publicity & PR - Distributes OotM info (posters and flyers) to schools, ​What's On, Retrospect; works with website/Facebook administrators; writes materials, press releases; works closely with School Liaisons. Event Planner - Arranges post-tournament parties, send-off galas, other events for team members such as a field trip to the Franklin Institute, Barnes Foundation, ComedySportz, Dept. of Making & Doing, etc. Collingswood Recreation Program Odyssey of the Mind (CRPOM) Board of Directors – This all-volunteer board is responsible for running the program, including recruiting coaches, registering teams, coordinating rehearsal space, coordinating with the Borough and the state OotM organization. Elections for the Board are held each May. Any adult with a child participating in the program is eligible to serve on the Board. 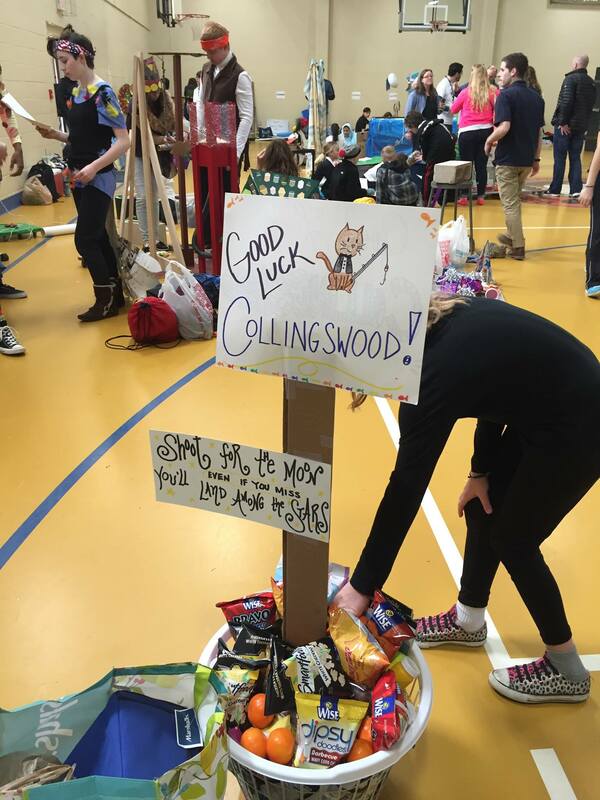 Collingswood Odyssey of the Mind Booster Club - This all-volunteer organization is responsible for fundraising to support the program, especially raising money to help send our teams to World Finals. Everyone involved in OotM in any capacity is encouraged to become involved with the Booster Club. Fundraising Worker Bee – Assists Booster Club fundraisers such as staffing the booth at the Farmer’s Market, selling raffle tickets, bringing children to fundraising events, etc. Contact or visit the Facebook page for more information about how you can volunteer.